Western Tokyo is an area containing Shibuya(渋谷区), Shinjuku(新宿区), Toshima(豊島区), Setagaya(世田谷区), Nakano(中野区), and Suginami(杉並区). These area are in recent years considered as the center of Japanese culture. Western Tokyo is the biggest downtown of Japan; it's the most populated area , it's the most actively changing area, and it's the most vibrant and stylish area in Tokyo. It's the city that never sleeps in full meaning. 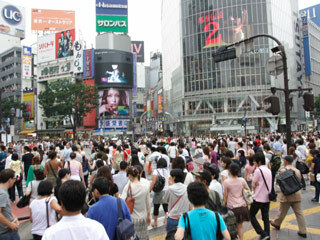 Famous spots in this area are: Shinjuku, Shibuya, Harajuku, Aoyama, and Ikebukuro. Government office of Tokyo is also located in this area. Use Shuto Express Way. Exit at Hatsudai. Use JR Yamanote Line to Shinjuku Station.